Welcome to the fourth edition of Africa Focus. This issue explores various ways in which African nations are becoming more hospitable to business and investment interests, depicting a fast-changing continent where—despite undeniable challenges—there is much cause for optimism. Bright spots include regional measures adopted to attract power sector investment, discussed in "Protecting energy sector investors in West Africa." In "Doing well by doing good," we consider the rise of impact investing, which presents great opportunities both for investors seeking solid returns and for African governments looking to address socioeconomic challenges. The continent also has the potential to lead on developing best practices with its maritime shipping sector, as we explain in "Sustainability in Africa's maritime industry." In "Proposed amendments to South Africa's Companies Act," our team provides an update on regulatory changes advanced to create a more business-friendly climate. The degree to which several African countries have succeeded on this front is the subject of "World Bank report highlights successes in Africa." Finally, we focus on the outlook for arbitration in "Resolving disputes in Africa's mining sector." Promising developments in Africa extend beyond the business sphere. This spring, White & Case is hosting and sponsoring a private opening preview of Sotheby's auction of Modern and Contemporary African Art in London. This client event celebrates the work of artists across the continent, with a strong focus on the independence and colonial eras. Modern and Contemporary African Art, Sotheby's newest department, was formed in 2016 to address growing market demand. Sales in this category have broken more than 50 artist records and attracted collectors from 40 countries across six continents. We hope you enjoy this edition of Africa Focus. Please let us know if there are topics or issues you would like us to cover in the future. Enthusiasm for responsible, sustainable investments shows no sign of abating. While these funds had philanthropic goals, return on investment (ROI) remained important. 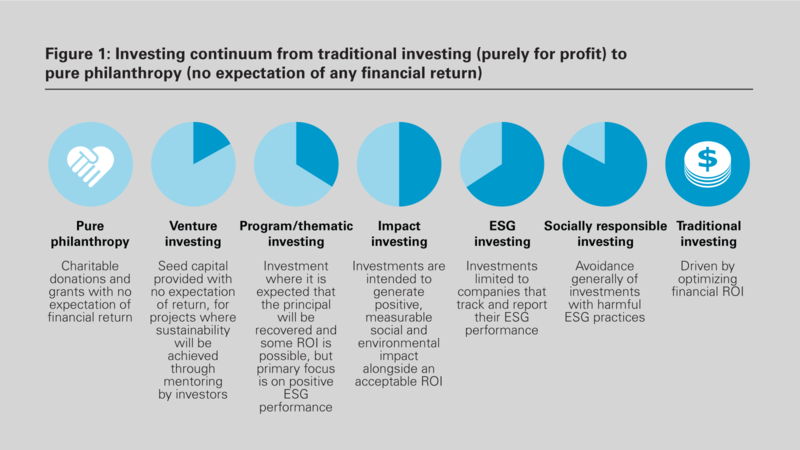 As standards evolved for assessing and verifying ESG performance, so did new approaches to investment, with funds investing only in businesses that tracked and reported their performance against those standards. Figure 1 shows the full investing continuum, from pure philanthropy focused only on the charitable impact, to traditional investment driven wholly by financial returns. This article focuses on impact investment, which aims to find a balance between the two. Impact investing strives not only to avoid investments that support harmful practices, but also to actively seek out opportunities that positively change the communities and ecosystems impacted by the target business, while delivering acceptable ROI. It represents a shift from merely avoiding negatives to proactively embracing positives—to do well by doing good. Historically, African governments have supplemented their budgets with official development assistance (ODA) to meet the needs of their populations.4 The 2008 financial crisis made inflows of ODA more volatile. As a result, over the last decade, private inflows of capital into Africa have been rising to replace funding previously provided by ODAs. African governments are therefore well positioned to capitalize on this increase in private investment and find market-based solutions to address their nations' socioeconomic challenges, particularly those highlighted in the African Union Commission's Agenda 2063. The need for market-based solutions in Africa, combined with an increased investor appetite for responsible and sustainable financing, illustrates that impact investment has the potential to become an important source of funding for African governments. It can serve as a tool to deploy private capital that effectively bridges existing funding gaps in several emerging-market economies across Africa. Approximately US$428.29 billion of investment assets in sub-Saharan Africa were dedicated to impact investment strategies. In addition to a number of specific impact investment strategies commonly used in Africa and further discussed below, several overarching principles underpin the impact investment market. These include initiatives such as the Sustainable Development Goals (SDGs). In 2015, as part of the 2030 Agenda for Sustainable Development, all United Nations member states adopted a shared blueprint for a better and more sustainable future for all. This blueprint includes 17 SDGs, each developed to address specific global challenges including poverty, inequality, climate, environmental degradation, peace, prosperity and justice.5 In addition to providing a useful framework for member states to use when developing their agendas and policy initiatives through 2030, the SDGs have given the impact investment industry a helpful set of quantifiable development objectives for investors to use when selecting suitable projects, funds or asset classes in which to invest. By distilling global challenges into a set of common goals, the SDGs united the global players—public and private sectors, NGOs and corporations, investors and startups—with a common vocabulary that naturally aligns with impact investing. In practice, the SDGs have provided an effective common framework. The GIIN 2018 Impact Investor Survey found that in the two years since their adoption, 55 percent of impact investors tracked their investment performance to the SDGs and another 21 percent said they planned to do so in the future.6 When questioned, the impact investors surveyed cited a number of reasons for doing so, including the ability to attract investors and investees, the ability to communicate impact externally against a widely recognized framework, integration into the global development paradigm and the ability to set appropriate targets and aims. As described above, with decreasing amounts of ODA available to African economies, governments will have no choice but to mobilize private funding to meet the SDGs by 2030, and the synergies between the SDGs and the aims of impact investment will help facilitate this. Enthusiasm for responsible, sustainable investments shows no sign of abating. This is promising given the significant need for private funding to address socioeconomic challenges in African economies to satisfy the SDGs. However, an important aspect of impact investment is the investors' ability and willingness to monitor the progress of their investments to ensure accountability and transparency and to inform future investment decisions. While there is no universally accepted definition or accreditation to determine which investments are classed as "impact investments," many market participants seek to implement certain impact investment strategies to ensure that their investments fulfill the required criteria to be deemed responsible investments. ESG integration: This involves integrating ESG factors into investment analysis, valuation and decision-making based on metrics and appropriate research resources. There are numerous ways to do this. For example, one can integrate ESG-related key performance indicators into staff objectives or consider ESG data when structuring a portfolio of investments. The AII Barometer showed that across East Africa, West Africa and Southern Africa, ESG integration had the heaviest weighting as a percentage of total assets compared to the investment strategies discussed below, and therefore is the most common strategy implemented by African impact investors. Investor engagement: Impact investors in Africa also used the investor engagement strategy, in which the relevant investor takes an active role in influencing company behavior through board participation, proxy voting or creating a dialogue with management on ESG matters. This was particularly prevalent in Southern Africa, where investor engagement had the second-highest weighting as a percentage of total assets (after ESG integration) compared to the other investment strategies. Screening: Some investors, particularly in East Africa, opted to implement a screening process for prospective investments. For example, this includes positive screening to select suitable investments, negative screening to exclude certain types of investments, and norms-based or best-in-sector screening processes. Theme-based strategy: Finally, some investors chose a theme-based strategy, focusing on a particular ESG factor, for example only selecting investments that related to environmental sustainability. 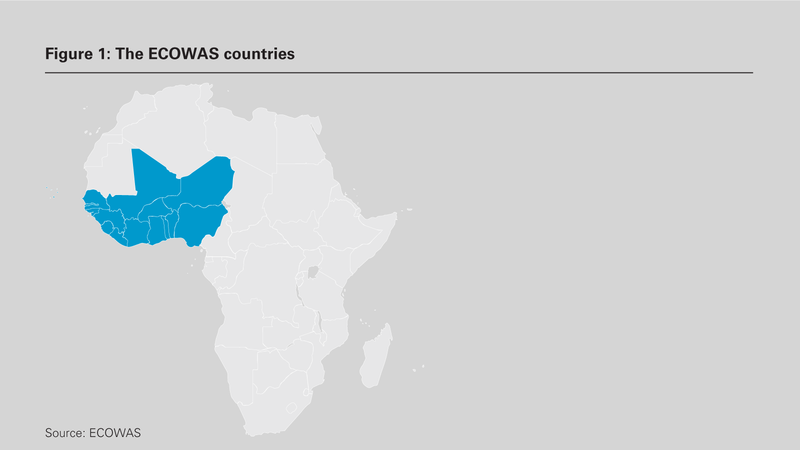 This strategy was particularly popular in West Africa, where it had the second-highest weighting as a percentage of total assets compared to the investment strategies outlined above. The GIIN 2018 Impact Investor Survey provides interesting insight into the minds of impact investors and current market trends.9 The GIIN Impact Investor Survey included 229 organizations participating in the impact investing industry globally in 2017, together managing more than US$228 billion in impact investment assets. The survey showed a strong presence in Africa, with 12 percent of these assets located in sub-Saharan Africa, 36 percent of respondents listing sub-Saharan Africa as one of their top-three geographies for capital deployment, and 6 percent of respondents having their headquarters in sub-Saharan Africa. 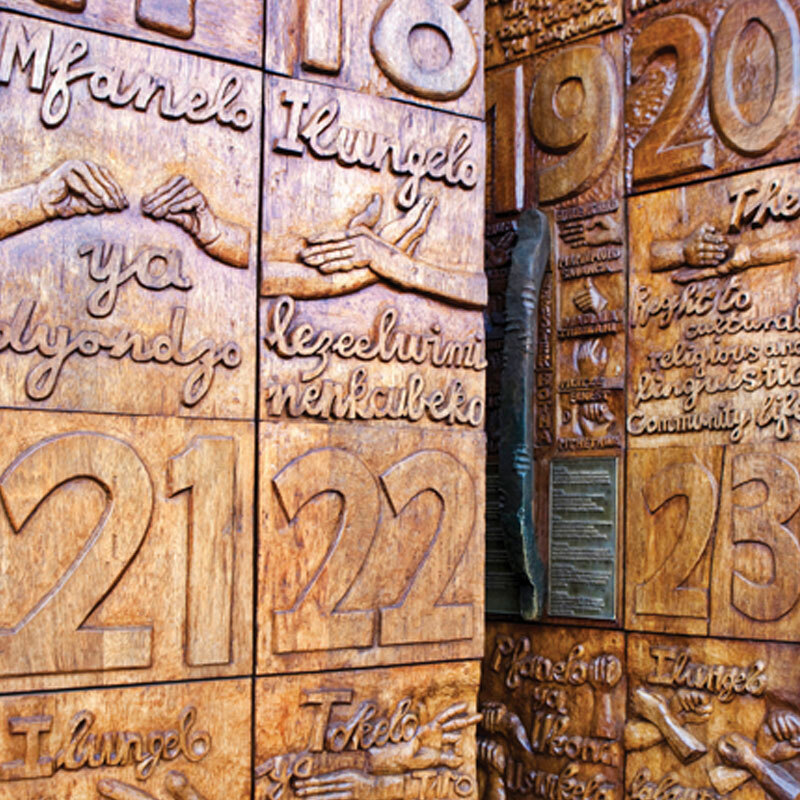 The AII Barometer provides a snapshot of impact investing trends on the continent. It shows that, as of the end of July 2017, approximately US$428.29 billion of investment assets in sub-Saharan Africa were dedicated to impact investment strategies, representing just over half of the total assets under management surveyed. Southern Africa was by far the most popular region for impact investment in Africa, representing approximately 93.3 percent of impact investment assets, while East Africa represented 4.3 percent and West Africa represented the remaining 2.4 percent. Impact investment is a market area that continues to grow, with some large, mainstream players entering the industry in the last year. Impact investment has increased in Africa in recent years and has the potential to contribute much to the continent's economic growth and development objectives by plugging the funding gap. However, the practice has yet to reach its full potential and still faces a number of significant challenges. Other significant challenges cited by Africa-focused investors were a lack of suitable exit options (35 percent), a need for more innovative deal or fund structures (35 percent), the impact measurement practice's low level of sophistication (32 percent) and a shortage of high-quality investment opportunities with an appropriate track record (32 percent). Two main issues emerge from these interrelated challenges. First, there is a gap in appropriate funding and deal structure suitable for entities in the early stages of growth. Second, there is a lack of consensus regarding appropriate definitions and performance measures in impact investment. The GIIN Impact Investor Survey found that in 2017, the overwhelming majority of investments (88 percent) were directed toward mature or growth-stage companies. Only 11 percent of investments were allocated to venture and startup businesses. Institutional investors have a fiduciary duty to their clients, so they must invest prudently and protect their financial interests. Accordingly, investors typically prioritize shorter-term returns and look for entities that can demonstrate historical performance. However, to achieve impact, fund managers may need to become comfortable with smaller average deal sizes (which drive up costs) and longer timeframes. This might not align with their investment approach or risk appetite. Early-stage enterprises often require financial support (as well as other forms of support such as regulatory, policy and training support) to develop and become "investment-ready," but providing this support at such an early stage, without a demonstrable track record or tested business plan, is risky and costly for investors. This funding gap contributes to a situation often referred to as the "missing middle," where early-stage companies are unable to establish themselves properly, leading to a low volume of established small and medium-sized enterprises and sustainable social enterprises.10 Particularly in Africa and other emerging markets, the general underdevelopment of the impact investment ecosystem may compound the situation. Lack of sufficient support structures to encourage and foster social entrepreneurship imposes further challenges. Clearly, it will take more work to develop suitable metrics in the field. As one respondent to the GIIN 2018 Impact Investor Survey explained, "Only by setting impact targets—and subsequently tracking performance—can we test our impact hypotheses and improve our understanding of impact creation for future investments.12 However, given the wide range of investors' priorities and scale in impact investing, and the diversity across the geographies of investees' sectors and business stages, employing standardized quantitative targets and arriving at an inclusive definition of what it means to be a sustainable social enterprise is a challenge in itself—and would likely be costly and time-consuming. Imposing too narrow a definition or strict legal requirements would likely deter both investors and prospective social enterprises. Investors in Africa and other developing markets may face additional impact investing challenges. These include emerging-market risks relating to unpredictability and market volatility, as well as the regulatory, political and economic environment. In the GIIN 2018 Impact Investor Survey, 46 percent of sub-Saharan Africa–focused investors identified "country and currency risks" as severe when it comes to making and evaluating investments. When providing additional color to risk experiences in 2017, respondents highlighted corruption risks, climate change-related disasters such as drought, and complex and changing economic and political environments, specifically citing recent political events in Kenya as an example. Impact investment is a market area that continues to grow, as seen by the entrance of some large, mainstream players into the industry in the last year. However, the expansion of impact investment into more mainstream consciousness also brings additional risks. In particular, the GIIN 2018 Impact Investor Survey highlights the risk of "impact washing,"13 where investors merely adopt the label of impact investing externally, without meaningful internal intention to affect change. However, investors in the GIIN 2018 Impact Investor Survey also understood the importance of greater transparency around impact to mitigate this risk. Increased transparency and reporting may also help to collect data and build a sufficient knowledge base to develop benchmarks for best practices in impact measurement. Given Africa's limited resources with which to finance the furtherance of the SDG objectives, impact investing will be a crucial catalyst for additional capital flows to address socioeconomic issues. While impact investment in Africa is growing, barriers still hinder the development and expansion of the practice on the continent. African governments must push to make inclusive growth and sustainable development a reality. The United Nations Procurement Division calls for greater engagement in general between key stakeholders across the sector and for Africa's policymakers and business community to join forces to develop a roadmap to advance the impact investment sector and create a supportive policy and regulatory environment. If these developments occur, impact investment could be an important tool for African governments going forward. The World Bank's annual Ease of Doing Business report assesses countries' regulatory environments and includes an "ease of doing business" ranking that orders countries from most to least business-friendly.1 It presents quantitative indicators on regulations affecting businesses across 190 world economies. These cover 11 areas: starting a business; paying taxes; minority-investor protection; labor market legislation; accessing electricity; registering property; dealing with construction permits; enforcing contracts; cross-border trading; getting credit; and resolving insolvency. A rise in ranking usually implies that a country has streamlined several of these regulations. Across 40 economies of sub-Saharan Africa, 107 business regulatory reforms were recorded between 2017 and 2018. In 2019, top-ranked countries include New Zealand (No. 1), Singapore (No. 2) and Denmark (No. 3). Lowest-ranked countries include Venezuela (No. 188), Eritrea (No. 189) and Somalia (No. 190). The 2019 report shows strong performances by several African countries. Mauritius (No. 20) and Rwanda (No. 29) ranked in the top quartile globally—Mauritius climbed five places since the 2018 edition. Rwanda climbed 12 places since 2018, a doubly impressive achievement considering that it ranked No. 139 in 2009. 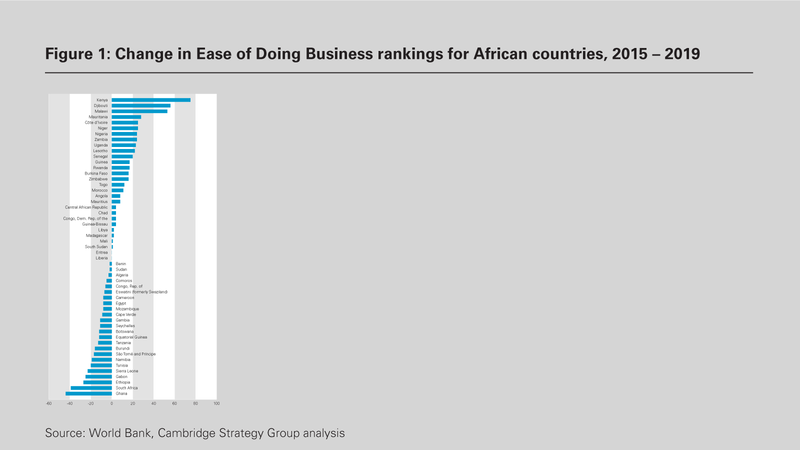 Looking back over five years, Figure 1 shows Ease of Doing Business rankings changes from 2015 to 2019 for all African countries and territories scored in both years. Over this time, ten African countries climbed ten or more places in the global rankings, while six slipped ten or more places: Ghana; South Africa; Ethiopia; Gabon; Sierra Leone; and Tunisia. Countries that made strong showings improved their rankings largely by making dynamic reforms to their business regulatory frameworks. Across 40 sub-Saharan African economies, 107 business regulatory reforms were recorded between 2017 and 2018. From 2016 to 2017, these 40 countries collectively undertook a further 83 reforms. Some sub-Saharan French-speaking countries achieved especially notable results. The report recognized Djibouti, Togo and Côte d'Ivoire as among "the 10 economies improving the most across three or more areas measured by Ease of Doing Business in 2017/18." Djibouti made the most impressive rise, climbing 55 places from No.154 in 2018, to No. 99 in 2019. This is especially remarkable given that, over the previous ten years, Djibouti consistently ranked between Nos. 155 and 171. Similarly, Togo climbed 19 places in the past year, and 25 over the previous decade from 2009 to 2018. Côte d'Ivoire's 17-place rise over the past year reflects a more consistent upward ranking trend each year. In total, Côte d'Ivoire climbed 46 places between 2009 and 2018. The complexity involved in creating and registering a limited liability company is a key driver of ease of doing business. It is therefore one of the first issues that must be addressed by countries seeking to enhance their business environments. Mauritius, for instance, streamlined its process by linking the databases of the business registry and the social security office. Togo also made it easier to start a business by reducing registration fees and introducing an online platform for company searches. The government of Mauritania eliminated company deed registration fees. Burundi slashed the business cost of registration from the equivalent of 33.9 percent of income per capita in 2017 to just 10.7 percent in 2018, making it three times less expensive to start a business in that country. Countries also accelerated their regulatory processes by centralizing obligations and documents. Cameroon, Chad, Djibouti, Gabon, Guinea and Togo are among the sub-Saharan African French-speaking countries that addressed this in 2018. For instance, in Togo, entrepreneurs now pay all registration fees directly to a single agency. Djibouti created a similar "one-stop shop" for startups, and Guinea allowed businesses to register with its labor promotion agency. Removing further obstacles, some countries reduced the minimum capital needed to create a limited liability company. In 2017, Togo required the equivalent of 31.5 percent of income per capita to create a company. Now, an entrepreneur needs only the equivalent of 6.7 percent of income per capita as minimum capital to create the same company. The gap is even more substantial in Central African Republic, where within one year, the minimum capital requirement was reduced from 446.7 percent of income per capita to 40.7 percent. A transparent, clear and easier-to-use tax system is another key ease of doing business driver. To attract investment and foster entrepreneurship, countries must address not only the level of taxation but also the systems in place for tax calculations, collections and refunds. Côte d'Ivoire and Togo, for instance, introduced online platforms to improve filing processes and collection rates for corporate, income and value-added taxes. Mauritius upgraded its existing online platform, making it possible to submit invoices and amended corporate tax returns online. The island further streamlined its procedures by introducing a processing system that shortens the time required for repaying value-added tax refunds. Several African countries undertook significant labor legislation reforms. For instance, Benin increased the maximum length of fixed-term contracts, with the aim of providing companies with more flexibility in their hiring options. Mali strengthened worker protections by establishing a guarantee of equal remuneration for work of equal value. The risks of majority shareholder abuses frequently deter investors from participating in corporations in which they cannot acquire majority control. The World Bank report places high importance on regulatory measures to protect minority investors. Part of Djibouti's dramatic rankings climb is due to a large number of reforms introduced to its commercial code, including an obligation to make available any information relevant to the subject matter to shareholders who bring a lawsuit against a company. Further, the new regulations require greater disclosures of transactions with interested parties and offer stronger remedies against interested directors. Both Djibouti and Mauritius stress enhanced corporate transparency by strengthening their existing requirements. The Ease of Doing Business report also addressed access to electricity, one of the most severe challenges to commerce and industry in Africa. A reliable power supply and the ability to connect to the electrical grid within a reasonable time, at an acceptable cost, are fundamental drivers of ease of doing business. 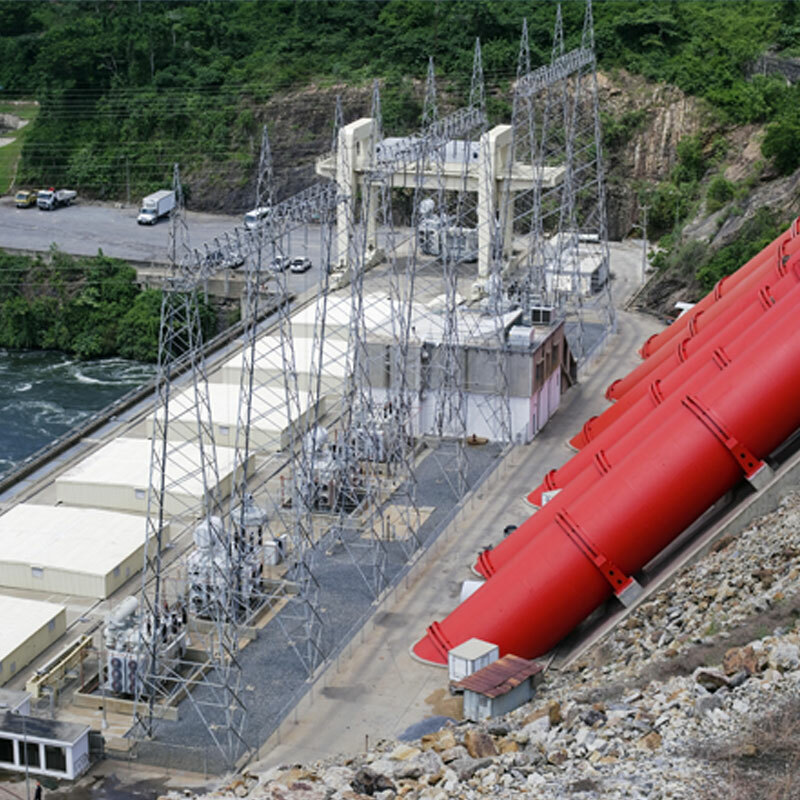 Both Gabon and Togo began recording data for the SAIDI and SAIFI indices (two reliability indicators of electricity provision) to address power outage issues. This enabled them to improve their monitoring and regulation of power outages. Niger shortened the time needed to obtain an electricity connection by streamlining its internal processes. By limiting the use of external works made by the electricity supplier and reducing the amount required as security for a new connection, Togo reduced the cost of a new electricity connection by 40 percent from 2017 to 2018. The Ease of Doing Business report noted that effective procedures surrounding property transfers and efficient land administration systems are also fundamental requirements for the development of businesses. Togo was able to lower both cost and time needed for property transfers by creating an office dedicated to property transfer and by reducing the property transfer tax. Djibouti reduced registration fees and set strict deadlines to register the sale agreement with the tax authorities, which made its procedures more effective. As part of its reforms to increase transparency and make land administration more efficient, Togo scanned most of its capital city's land titles and made ownership records freely accessible online. Similarly, Djibouti scanned the land titles for its capital city and required the registration of all property sales transactions at the land registry as a condition to enforceability against third parties. Niger rationalized the exchange of information procedure between its taxation department and its registration department, and Senegal did the same for its different departments at the property registry. To operate easily, businesses require efficiency from the agencies responsible for reviewing construction permit applications and issuing construction permits. Entrepreneurs must be able to obtain construction permits at reasonable cost and within reasonable timeframes, and regulators need to ensure that planned constructions are legal and safe. Guinea saw slight improvements in this area. It now takes an average of 151 days to obtain a construction permit, while it would have taken 161 days a year ago. Madagascar, Togo and Gabon made significant strides in building safety while reducing associated fees. 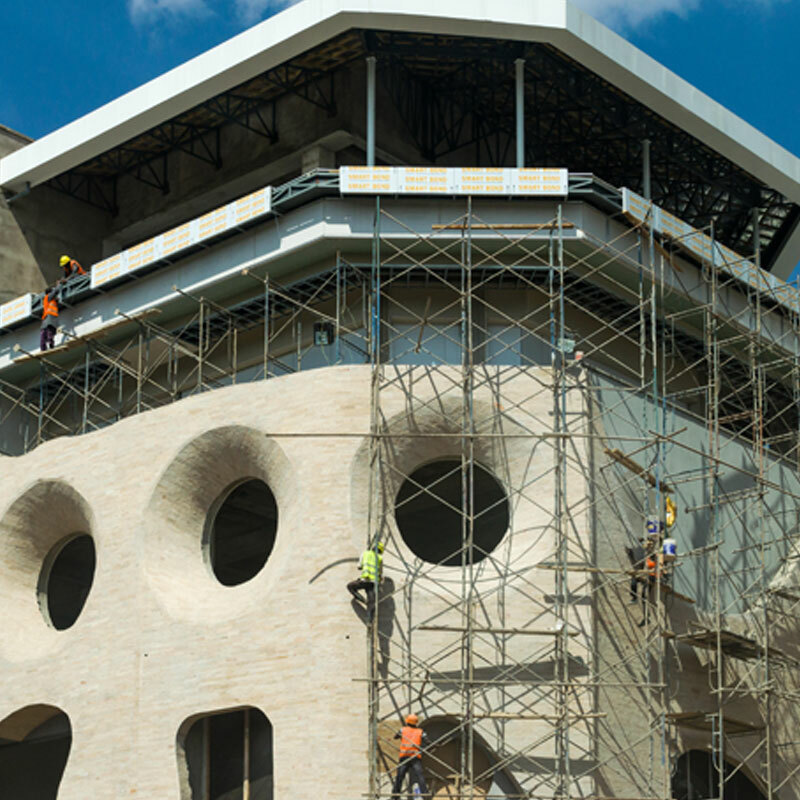 In 2018, Madagascar appointed an independent architect to a commission charged with reducing construction permit costs and enhancing building safety. Results were impressive. The cost of a construction permit dropped from 54.5 percent of warehouse value in 2017 to 36.3 percent in 2018. The country's grade, granted in relation to building quality control also improved. Gabon and Togo were also able to make their processes safer by implementing decennial liability and insurance. For Togo, this was reflected in a dramatic score improvement, from 20 percent in 2017 to 53 percent in 2018. The Ease of Doing Business report also considered the quality of the judicial process, as well as the time and cost necessary to resolve a commercial dispute. Djibouti was particularly active in this area, adopting a new Civil Procedure Code, which not only provides a new legal framework for voluntary conciliation and mediation proceedings, but also sets time standards for important events in court. This year, Djibouti also created a specialized commercial disputes division within its first-instance court. There were also substantial legal developments in West and Central Africa, where the members of the OHADA2 adopted a new "Uniform Act on Mediation" in 2017. This Act provides a sophisticated legal framework related to all aspects of mediation for the OHADA's 17 members. Implementing this new alternative dispute resolution mechanism will make it easier and faster to enforce contracts in the region. It is well recognized that intra-African international trade requires improvement to achieve development objectives for the continent. To strengthen economic competitiveness, it is essential to reduce delays and costs surrounding imports and exports. To this end, the Democratic Republic of the Congo implemented a national trade single window, enabling international traders to submit their regulatory documents to a single regulatory body. Guinea eliminated the requirement for pre-shipment inspection of imports. In Mauritius, the introduction of a risk-based management system reduced border compliance time by 14 hours (from 38 in 2017 to 24 now) and eased exportations from the island. Africa's retail banking industry is growing rapidly, but market penetration remains poor by global standards. This hampers entrepreneurs' access to credit— and working capital to grow their business. Efficient, sophisticated security laws are crucial to solving this problem. By offering more legal instruments to banks and other investors to secure their lending, a country can encourage them to offer more credit to its entrepreneurs and lower related costs. When Djibouti modernized its regulatory framework, it reformed its security law specifically to enhance access to credit. These reforms broadened the scope of assets that can be used as collateral. It is now possible to use future assets as collateral, and secured creditors now have absolute priority, outside of bankruptcy. The "Uniform Act Organizing Securities," adopted in 2010, brought OHADA members harmonized, sophisticated security law. This reliable legal framework reinforces lenders' rights and enables the use of efficient security arrangement mechanisms, such as out-of-court appropriation (pacte commissoire). It also made it possible to appoint a security agent acting in its own name, on behalf of the lenders. As a result, OHADA members' grades notably stabilized or steadily improved over the last decade. Finally, the report assessed the quality of the insolvency instruments offered by each country's legislation. The Ease of Doing Business report evaluated the time and expense it takes to resolve a commercial insolvency and the recovery rate. Djibouti enhanced its insolvency proceedings by making them more accessible for creditors and by granting them greater participation in the proceedings. Burundi streamlined the insolvency framework, expanding the scope of insolvency law and introducing preventive measures. The OHADA member states adopted the Uniform Act Organizing Insolvency in 2015. This Act modernized and clarified rules governing insolvency proceedings in the OHADA member states, which are all in West and Central Africa. It facilitates the preservation of debtors' economic activities and levels of employment and protects viable companies in temporary distress. The Act also establishes a precise payment order for creditors. Disappointing rankings for many other African countries contrast with the good news, though in most cases scores did not fall. Among the approximately 20 sub-Saharan African French-speaking countries, only two saw their scores drop from 2018 to 2019. But in an era when many countries are working actively to enhance their ease of doing business scores to promote business development and attract foreign direct investment, those countries that stand still are bound to fall in the rankings. 2 OHADA (Organization for Harmonization of Business Law in Africa) is composed of 17 West and Central African countries (Benin, Burkina Faso, Cameroon, the Central African Republic, Chad, Comoros, Côte d'Ivoire, the Democratic Republic of the Congo, Equatorial Guinea, Gabon, Guinea, Guinea-Bissau, Mali, Niger, Senegal and Togo), which have adopted a common system of corporate and business law and implementing institutions. The laws promulgated by OHADA are deemed exclusively business-related and are directly applicable in each of the 17 member states. 3 One Belt, One Road is a development strategy launched by China in 2013, involving infrastructure development and investments in countries across the globe, principally in Asia, Africa and Europe. The operation of South African companies is regulated by the Companies Act of 2008 (the Companies Act), which replaced the Companies Act of 1973. In turn, the 1973 Companies Act replaced South Africa's first company legislation, the Companies Act of 1926. One of the primary aims of adopting the Companies Act nearly a decade ago was to bring South Africa's company legislation up to date with modern requirements. However, it has not necessarily helped make it easier to do business in South Africa. Now, new amendments to the Companies Act have been proposed. Among other things, they are intended to make the legislation more business-friendly. The Minister of Trade and Industry published the proposed amendments for comment in September 2018, and the comments period closed in December 2018. We consider several of the contemplated changes positive and discuss them in detail below. Proposed Section 38A of the Companies Act is welcome as it gives a court the power to retrospectively validate invalid share creations, allotments or issuances where doing so is just and equitable. The Companies Act currently provides that an amendment to a memorandum of incorporation (MOI, a South African company's constitutional document) takes effect on the date on which the notice of amendment is "filed" with the Companies and Intellectual Property Commission (CIPC) (or such later date specified in the notice of amendment). The meaning of the word "filed" has been subject to debate. Does "filed" mean when the notice of amendment to the MOI is delivered to CIPC, or only once CIPC sends its notice confirming that the MOI has been accepted and placed on file? Literally interpreted, "filed" means the point in time when the MOI is physically delivered to (i.e., filed with) CIPC. However, CIPC issued a non-binding opinion to the effect that an MOI only takes effect once CIPC sends its notice confirming that the MOI has been accepted and placed on file. This has led South African lawyers to take a conservative approach and only close transactions once the MOI has been accepted and placed on file by CIPC. There is good reason for this conservative approach. If CIPC's view is correct, and the parties elect to close a transaction before CIPC sends its notice confirming that the MOI has been accepted and placed on file, then for example, the issuance of newly created shares on closing would be void unless ratified within 60 business days after the shares were purportedly issued. Additionally, minority protections (which, under the Companies Act, must be captured in the MOI to limit a board's powers) will not be effective until the MOI has been accepted and placed on file. The requirement that an amendment to an MOI be accepted and placed on file by CIPC before closing often results in substantial closing delays, as it has often been the last suspensive condition to be fulfilled. The proposed amendment to the Companies Act provides that an amendment to an MOI becomes effective on the earlier of CIPC endorsing the relevant notice of amendment or ten business days after receipt by CIPC of the notice of amendment, unless CIPC rejects it with reasons. This proposed amendment is helpful, because the parties to a transaction will now know whether the suspensive condition requiring the amendment of an MOI to have become effective has been fulfilled within ten business days after CIPC's receipt of the notice of amendment. This contrasts with being required to delay closing until CIPC sends a notice confirming that the MOI has been accepted and placed on file. New amendments to the Companies Act are … intended to make the legislation more business-friendly. Section 38(2) of the Companies Act currently provides that if a company purportedly issues shares that exceed what the company's MOI authorizes, the purported issuance may be retroactively authorized (through a board or shareholder resolution, depending on the circumstances) within 60 business days after the shares were purportedly issued. Section 38(2) of the Companies Act raises a practical issue: If an error of this nature were to occur, it is unlikely to be identified within the 60-business-day period. And once that time-period elapses, there is no basis on which to rectify the invalid issuance. Proposed Section 38A of the Companies Act is welcome, as it gives a court (pursuant to an application made by the company concerned or an interested party, such as a shareholder or a third-party subscriber who has subscribed for invalidly issued shares) the power to retrospectively validate invalid share creations, allotments or issuances where doing so is just and equitable. Some ambiguity exists as to what the legislature intended as the precise effect of the proposed amendment to Section 45 of the Companies Act. The commentary to its drafting indicates that the intention was to remove the requirement for passing a special resolution where a holding company provides financial assistance to a subsidiary. However, as currently drafted (in addition to removing the requirement to pass a special resolution), the proposed amendment also removes the requirement for a holding company to pass the Solvency and Liquidity Test. We see no reason to obtain a special resolution when a holding company is providing financial assistance to its subsidiaries, because all shareholders of the holding company are in the same position vis-à-vis one another and therefore minority shareholders should not be oppressed. In addition, from an operational perspective, the proposed amendment will make intra-group loan arrangements much more manageable, because the administrative burden of obtaining special resolutions from shareholders of holding companies for financial assistance to subsidiaries will be removed. However, there is a counterargument. Under the current regime, the holding company's shareholders will, by virtue of the special resolution requirement, have knowledge (at least generally) of the maximum amount of financial assistance that a holding company intends to provide to its subsidiaries. If the requirement to have a special resolution passed is removed, then shareholders of the holding company are unlikely to have any knowledge of the extent of financial assistance provided by a holding company to its subsidiaries until after the fact, when presented with annual financial statements. Although the current drafting of the proposed amendment is unclear, the legislature surely could not have intended to remove the requirement for a holding company's board to pass the Solvency and Liquidity Test when providing financial assistance to subsidiaries. We say this because solvency and liquidity is a fundamental principle of the Companies Act. Removing the requirement that a holding company pass the Solvency and Liquidity Test before providing financial assistance to its subsidiaries would cut across a fundamental creditor protection that prevents a holding company from shifting its assets to its subsidiaries in circumstances where it is unable to pass the Solvency and Liquidity Test. We acknowledge that there are already provisions in the Insolvency Act No.24 of 1936 dealing with, among other things, voidable dispositions that creditors could rely on. But creditors enjoy a greater degree of protection if the provision of financial assistance by a company is treated as void ab initio in circumstances where the company has not passed the Solvency and Liquidity Test. Issues concerning marine management in Africa are being tackled head-on by a range of international agreements. There are already four regional agreements across Africa that collectively seek to protect, manage and develop the marine and coastal environments of Africa and the Western Indian Ocean. These agreements have been widely endorsed. Almost all African costal states have signed at least one regional agreement, and only three have not signed any regional agreements. Institutions such as the International Maritime Organization (IMO) are also actively creating new international agreements and protocols to address environmental issues such as marine pollution, oil spills and emissions from the shipping industry. IMO agreements and protocols are regularly updated in order to keep up to speed with new environmental challenges and the latest available scientific evidence. In so doing, the IMO has opened up pathways for African coastal states, shipping registries and ports to innovate and meet the challenges of sustainable development. Ships that comply with green standards are more likely to be exempt from environmental taxes and fines, which could represent considerable savings over the operational life of a ship. 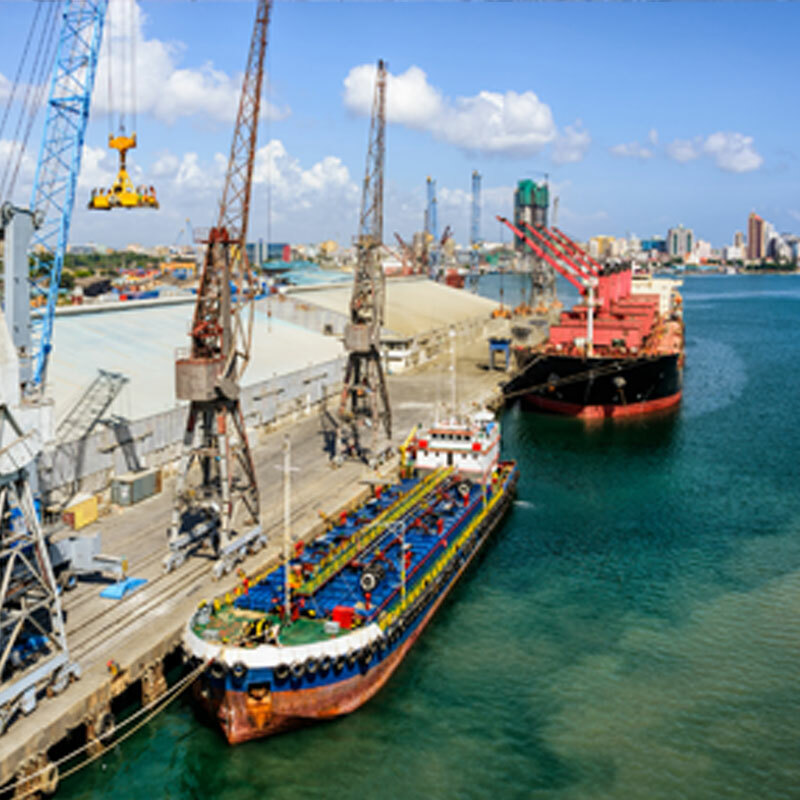 Africa's growth in the maritime industry highlights the potential for positive impacts on its socioeconomic development, especially of coastal states, but it also poses challenges. 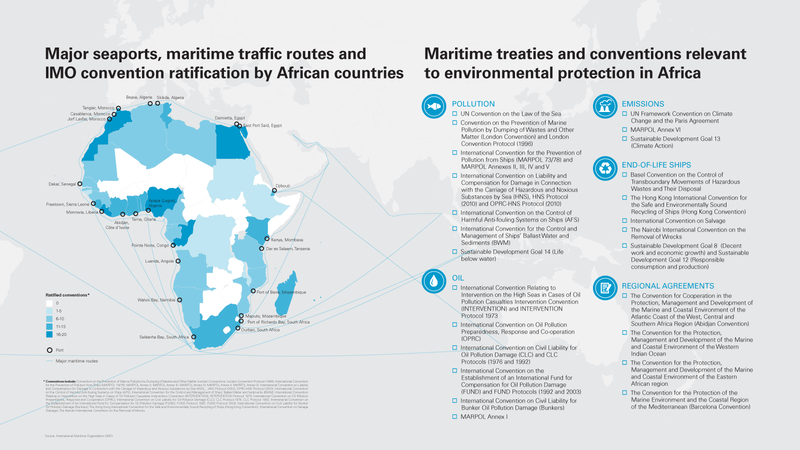 As Africa's maritime sector grows, with increasing marine traffic and cargo volumes through its ports, so does the potential for heavier environmental and social impacts. In this context, nascent businesses have an opportunity to ensure that, by complying with international standards from the outset, their operations will help to develop a maritime industry that conforms to environmental and social sustainability practices that will benefit current and future generations of Africans. Green shipping is indicative of the strides made in the industry to address its various impacts on human health and the environment. It addresses the preservation and protection of the global environment from greenhouse gas (GHG) emissions and other pollutants generated by the industry and contributes to achieving the UN Sustainable Development Goals. In practice, the "green" standard entails compliance with the major IMO pollution-related conventions and their protocols that many coastal African countries have ratified. The IMO commitment to sustainable development is designed to encourage innovation and technology transfer. The uptake of eco-friendly ship design by forward-thinking companies has increased over the past few years, with more companies producing and using eco-friendly ships as part of their operations. As marine pollution becomes more heavily regulated, investment in new ships that are compliant with current (and anticipated future) IMO regulations is becoming a competitive advantage. Ships that comply with green standards are considered more likely to be exempt from environmental taxes and fines, which could represent considerable savings over the operational life of a ship. In effect, the higher the green standard of the ship at the beginning of its life, the longer its operational life may be without the need for potentially expensive retrofitting. In addition, compliant ships are considered inherently more fuel-efficient, which also contributes to substantial operational cost savings. With more than 75 percent of the planet covered by water, marine pollution is one of the most intractable global environmental challenges, and one the world will face for many generations to come. Shipping now accounts for the majority of the world's trade transportation, and the sheer volume of freight being transported means that a certain level of marine pollution is inevitable. 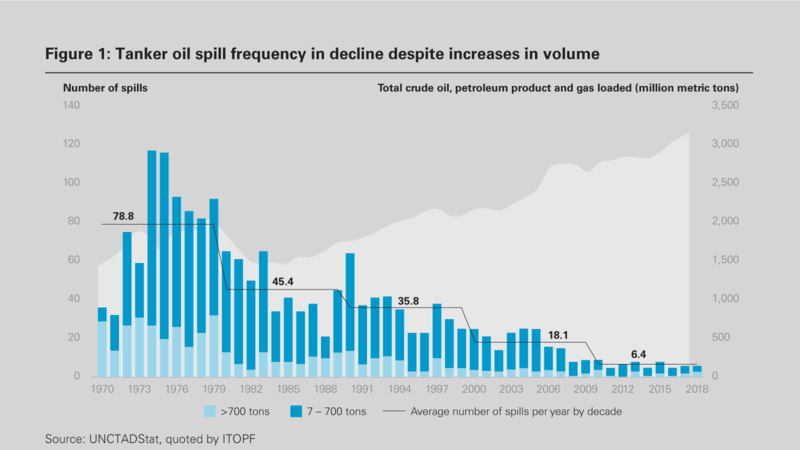 Although the shipping sector has recognized its role in environmental and social protection, and has made great strides in preventing and reacting to oil spills—which are a visible environmental impact of shipping—mitigating risks to the oceans remains a concern (Figure 1). Oceans, coastlines, estuaries and other coastal areas may suffer from ecological damage as a result. For coastal states in Africa, marine pollution also creates negative secondary effects on human health and socioeconomic activities such as tourism, aquaculture and fishing. Plastics are another very visible form of marine pollution that have become a source of major international concern. Although most of the plastics in the oceans originate from pollution on land and reach the sea through rivers, approximately 20 percent of the sources of plastic pollution are marine-based, through both legal and illegal dumping.4 Outside of oceanic convergence zones, which are known as floating "garbage patches" of plastics and other wastes, such debris also tends to accumulate in shipping lanes and fishing areas. Plastics are immensely durable and some persist in the marine environment for hundreds of years. Scientists are only now beginning to understand the risks of microscopic plastic fragments entering marine food chains, including bioaccumulation in apex predators and in humans consuming food from marine sources. With the rise of global trade and increased fuel consumption in the shipping industry that accompanies it, air emissions from shipping continue to rise. In May 2005, Annex VI of MARPOL took effect to address the negative impacts of air emissions from ships (from SOX, NOX, ozone-depleting substances and volatile organic compounds from shipboard incineration) and includes mandatory energy-efficiency measures to reduce GHG emissions. In April 2018, the IMO's Marine Environment Protection Committee (MEPC) adopted the Initial IMO Strategy on reduction of GHG emissions from ships (the Strategy). All ships are required "to give full and complete effect, regardless of flag, to implementing mandatory measures to ensure the effective implementation" of the Strategy.7 Possible short-term measures identified include the development of technical and operational energy efficiency measures for ships; encouraging national action plans for GHG emissions from international shipping; encouraging port developments to reduce GHG emissions, including ship and shore renewable power supplies and infrastructure to support low-carbon fuels; and providing incentives to develop and adopt new technologies. SOX is considered one of the most harmful by-products of the combustion of ship fuel. High SOX concentrations are well recognized as a dangerous atmospheric pollutant. The IMO has consequently also introduced regulations to reduce SOX emissions from ships. These regulations, which took effect in 2005, have become increasingly stringent over time; for example, a proposed reduction of the global sulfur cap from 3.50 percent to 0.50 percent will be effective January 1, 2020 (the 2020 Limit). Under the MARPOL amendments, the carriage of non-compliant fuel oil (for combustion for propulsion or operation) is prohibited unless the ship is fitted with a scrubber system for exhaust gas cleaning. Scrubber installation is an accepted way to meet the sulfur limit requirement. Although the sulfur cap will apply globally, since the beginning of 2015, designated sulfur emission control areas have the further restriction of a lower limit of 0.10 percent. Another by-product of the shipping industry is "shipbreaking." Ship- breaking, or ship decommissioning, is the process by which ships are dismantled in order for their parts to be recycled or sold. On its face, as a form of recycling ships and their contents, it is considered a "green" activity. However, the International Labour Organization (ILO) has declared shipbreaking to be one of the most dangerous professions in the world. It may take place as part of an opportunistic activity, where ships are abandoned on coastlines with no controls on salvaging, or as part of organized ship recycling operations. Nouadhibou, Mauritania has the dubious distinction of being the largest ship graveyard in the world—the coastline is a landscape of more than 300 rotting ships. The most common form of shipbreaking is to have the vessel beached on a mudflat during high tide, where it is dismantled, typically by unskilled local workers. This method of shipbreaking, referred to as "beaching," is a dangerous industry with potentially damaging environmental and human health and safety consequences. In countries where shipbreaking is common, any lack of regulatory oversight means there is a high risk of worker health and safety impacts, as well as unsustainable wages, forced or child labor, and other worker-related concerns. Weaker laws and enforcement provide a conducive regulatory environment for uncontrolled shipbreaking operations to flourish. End-of-life ships also contain toxic materials such as asbestos, heavy metals, oil residues and organic waste, such as tributyltin (or TBT, an extremely toxic compound used in anti-fouling paints). These pollutants require special containment, and that may not be feasible in informal breaking yards. In addition to ship owners and flag states, national ports also have a duty to inspect foreign ships, to ensure that the condition of each ship and its equipment comply with relevant international regulations. Even in developing countries that have applicable environmental and social standards in place, there may be a lack of enforcement of the regulatory requirements protecting worker rights or the environment, and corruption might be the prevailing way of conducting business. The monetary cost savings from beaching are ultimately represented by harm to human health and the environment, as well as socioeconomic impacts to livelihood from tourism or fishing. Nouadhibou, Mauritania has the dubious distinction of being the largest ship graveyard in the world. For several decades, end-of-life ships have been abandoned there, and the coastline is now a landscape of more than 300 rotting ships. This number continues to grow each year as a thriving salvage industry has emerged, contributing to speculation that large-scale beaching practices could move to parts of coastal Africa as the location of choice. Potential host African coastal states could benefit from end-of of-life vessel recycling without compromising human health and safety and environmental protection, as there are international protocols addressing the ship recycling industry. The Hong Kong Convention for the Safe and Environmentally Sound Recycling of Ships (2009) (Hong Kong Convention) requires that the recycling of ships must not pose unnecessary risks to human health, safety and the environment. To date, the Hong Kong Convention has only been ratified by seven countries and therefore has not taken effect. It will only enter into force two years after certain criteria for its ratification have been met, including the requirement that 15 countries, representing 40 percent of the world's merchant shipping by gross tonnage, ratify the agreement. The only African country to have ratified the Hong Kong Convention is the Democratic Republic of the Congo. Nonetheless, the IMO has issued the Guidelines for Safe and Environmentally Sound Ship Recycling (2012) (the 2012 Recycling Guidelines). These align with the Hong Kong Convention, so meeting these guidelines represents good international industry practice and will prepare ship owners and recyclers to be in compliance with the Hong Kong Convention when it takes effect. This has the added benefit of protecting workers and the environment in African countries. Under the waste law regime of the Basel Convention on the Control of Transboundary Movement of Hazardous Wastes and their Disposal (Basel Convention), end-of-life vessels are considered hazardous waste. Through the EU Waste Shipment Regulation,11 the EU has transposed into community law the "Basel Ban" Amendment, which prohibits any export of hazardous wastes from a developed (OECD) country to a developing (non-OECD) country. As a consequence, if an end-of-life vessel is flagged to a developed country, it should therefore not be transported for disposal to any developing country, in Africa or elsewhere. To avoid complying with these prohibitions, some ship owners resort to transferring end-of-life vessels to dealers or other intermediaries once the vessel has left EU territory or is on the high seas.12 The ship may then be sold to a shipbreaking yard or abandoned at places like Nouadhibou, in contravention of the Basel Convention. Scrap dealers may also seek to change the flag of the ship to disguise its origin, making it more difficult to practically enforce international requirements. Low registration standards combined with minimal vetting of ships creates a higher risk that vessels flagged to countries that have less stringent registration requirements are operating in breach of international standards. Registries therefore play a key role in managing requirements such as environmentally sound ship decommissioning as well as human rights obligations more broadly. In 2009 the IMO introduced the innovative concept of a "Green Passport," requiring ship operators to provide information about all the materials aboard the ship that were known to be potentially hazardous. In 2011, the IMO introduced the concept of an International Certificate on Inventory of Hazardous Materials (IHM) to replace the Green Passport. The IHM is specific to each ship and must contain information about any hazardous material in the structure of the ship or its equipment, generated through operations or stored on the ship. The 2012 Recycling Guidelines require the development of a ship recycling plan (SRP) to ensure that the ship owner and ship recycling facility work together on management of hazardous materials, safety procedures, dismantling sequences and any other elements to ensure compliance with the Hong Kong Convention requirements. The IHM and the SRP are crucial developments in ensuring that ship builders, operators and recyclers are all responsible for decommissioning ships in a socially and environmentally responsible manner. With improved information about hazardous materials, recyclers are able to use advance planning to reduce or eliminate environmental contamination and social risks. In addition, by having a transparent, ongoing reporting system of this kind, both operators and recyclers can ensure that they are providing for and mitigating any risks of liability for environmental contamination or harm to humans. 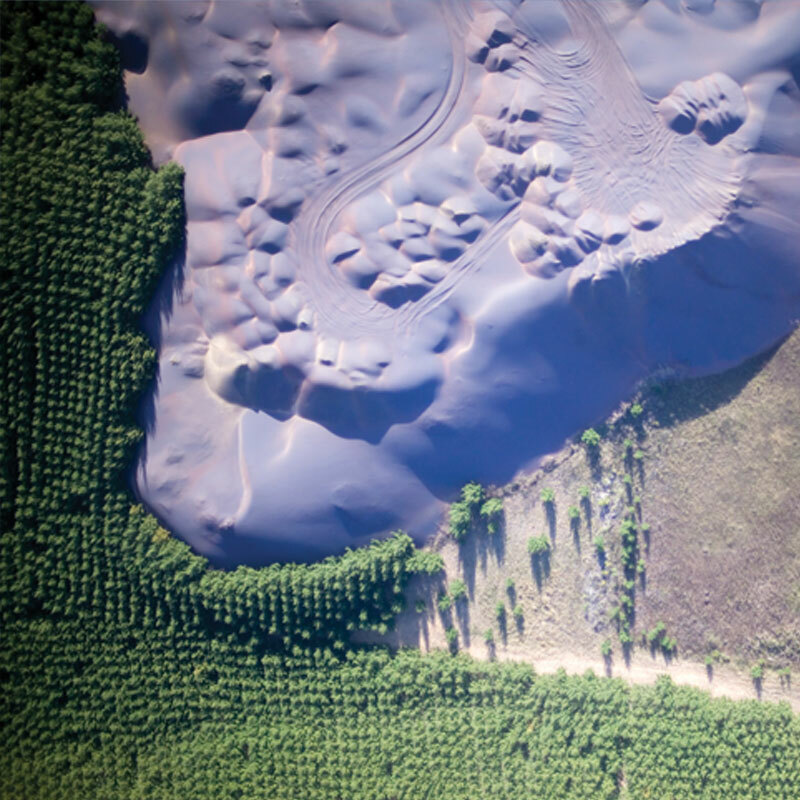 Over the past ten years, lenders have become increasingly aware of environmental and human rights issues. In a concerted international effort for investments to move toward environmental sustainability, international institutions have been developing green industry standards. The most well-known green financing standards are the Green Bond Principles, established by the International Capital Market Association (ICMA) in 2014. Green bonds are any type of bond instrument where the proceeds will be exclusively applied to finance "green" projects (e.g., environmental protection, sustainability, climate change solutions and renewable energy projects). The green bonds market has exponentially increased since the Green Bond Principles took effect. In May 2018, the world's first shipping sector-labeled green bond was issued by Nippon Yusen Kaisha (NYK). Designed to support NYK's management plan, "Staying Ahead 2022 with Digitalization and Green," it aims to integrate environmental, social and governance (ESG) principles for sustainable development using the funds for new and existing projects in NYK's "Roadmap for Environmentally Friendly Vessel Technologies." This includes liquefied natural gas (LNG)-fueled ships, LNG bunkering vessels, ballast water treatment equipment and SOX scrubber systems. As the "Green Economy" develops, gaps for the sustainable management of oceans have appeared, giving rise to the concept of the "Blue Economy," which is defined by the World Bank as "sustainable use of ocean resources for economic growth, improved livelihoods and jobs, and ocean ecosystem health. "14 The Blue Economy encompasses activities in the renewable energy, tourism, climate change, fishing, waste management and maritime transport sectors. "Blue Finance" is still an emerging concept. However, the Seychelles has become the first country in the world to put Blue Finance measures into effect. In 2016, the Nature Conservancy, through its investing arm NatureVest, developed a US$22 million sovereign debt conversion for the Seychelles. Through this, approximately 30 percent of the Seychelles is in the process of being designated a Marine Protected Area (MPA). In October 2018, the Seychelles became the first entity to issue a sovereign Blue Bond to expand its MPAs, improve the governance of fisheries and develop the Seychelles' Blue Economy. The US$15 million Blue Bond is partially guaranteed by the World Bank and supported by the Global Environment Facility. In addition to being a major milestone in Blue Finance, the Seychelles' Blue Bond provides strong evidence that sustainable development of the Blue Economy is possible, as well as mutually beneficial for international investors. To ensure the sustainable use of oceans and their resources, in March 2018, the European Commission, World Wildlife Fund, the UK Prince of Wales's International Sustainability Unit and the European Investment Bank (EIB) jointly released a set of voluntary Sustainable Blue Economy Finance Principles (the Blue Principles). Without duplicating existing frameworks, the Blue Principles are intended to implement the UN Sustainable Development Goals, especially those that contribute to the management of the oceans (e.g., SDG 12 on responsible consumption, SDG 13 on climate action and SDG 14 on life below water). The Blue Principles are also intended to comply with IFC Performance Standards on Environmental and Social Sustainability and the EIB Environmental and Social Principles and Standards. With the rapid expansion of the African maritime industry, African countries have an opportunity to become world-class leaders in sustainable shipping practices. One means of ensuring the development of Africa's maritime industry is by increasing resources and capacity-building to strengthen institutions responsible for policing environmental and social legislation. Protecting marine and coastal ecosystems in Africa is essential for achieving the international commitments that African countries have made and for protecting the health and welfare of coastal populations, biodiversity and for socioeconomic progress. 3 Greyer, R. (2017) "Production, use and fate of all plastics ever made," Science Advances. 4 Greyer, R. (2017) "Production, use and fate of all plastics ever made," Science Advances. Unreliable, expensive power supplies have been key obstacles to commerce and industry in the region—and as a result, to economic growth. According to the OECD, "Investment treaties were developed to protect investors of one country when investing in another country, to lower non-commercial risk for such investors, and overall to promote a sound investment climate. "1 Although some commentators have opined that the network of bilateral investment treaties among African countries and between African countries and third countries is rather "underdeveloped, irregular and fragmentary,"2 African regional organizations have, in fact, entered into a variety of multilateral agreements to promote and protect intra-African foreign investment. These agreements, which include the Investment Agreement for the Common Market for Eastern and Southern Africa (COMESA) Common Investment Area and the Supplementary Act adopting Community Rules on Investment and the Modalities for their Implementation with the Economic Community of West African States (ECOWAS3, see Figure 1) give investors the opportunity to bring international claims against countries for wrongful measures impacting their investments. Energy sector investors will be pleased to know that, parallel to these multilateral "generalist" agreements, some African regional organizations have concluded sector-specific regional agreements for the energy sector. These include the ECOWAS Energy Protocol A/P4/1/03 signed by members of ECOWAS in 2003 (the "Energy Protocol"). 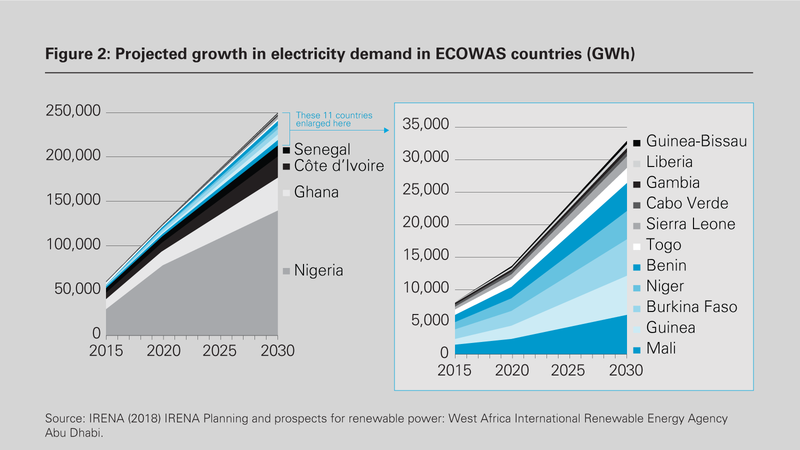 This is an important development, given increasing demand for electricity in the ECOWAS countries and consequent emerging opportunities for investment (Figure 2). The Energy Protocol was inspired by the Energy Charter Treaty (ECT), a multilateral sector-specific international agreement allowing for investor-state claims that took effect in 1998. The ECT had some success with 51 countries worldwide becoming contracting parties. Its influence is apparent in the Energy Protocol, which likewise provides for investor-state dispute resolution. Given a recent trend toward reduced investment protection in some African countries such as Tanzania and South Africa,5 the Energy Protocol offers potentially valuable and often overlooked protection to energy sector investors in West Africa. Based on information provided by ECOWAS, 13 out of 15 ECOWAS member states have ratified the Energy Protocol. At the time of publication, Côte d'Ivoire and Sierra Leone had yet to ratify. Pursuant to Article 39 of the Energy Protocol, since more than nine instruments of ratification have been deposited, the Energy Protocol has entered into force. Thus, investors from contracting parties to the Energy Protocol can now invoke the investment protections set out in Chapter III in relation to their investments in other contracting parties, which are summarized below. Under the Energy Protocol, "investment" is broadly defined to include "every kind of asset, owned and controlled directly or indirectly by an Investor." It covers, among other things, tangible and intangible property, a company or business enterprise, shares, stock, or other forms of equity participation in a company or business enterprise, claims to money and claims to performance pursuant to a contract having an economic value and associated with an investment as well as any right conferred by law or contract or by virtue of any licenses and permits granted pursuant to law to undertake any economic activity in the energy sector. An investor is defined as a natural person having the citizenship or nationality of, or who resides or establishes an office in the area of, a contracting party or a company or other organization organized, or registered, in accordance with the law applicable in that contracting party. This definition is similar to the definition of investor under Article 1(7) of the ECT. However, under Article 17 of the Energy Protocol, each contracting party has, among other things, reserved the right to deny the investment protections of the Energy Protocol to a legal entity "if citizens or nationals of a third state own or control such entity and if that entity has no substantial business activities in the Area of the Contracting Party in which it is organized." This provision, which is generally referred to as a denial of benefits clause, is designed to exclude from treaty protections nationals of other countries that, through mailbox or shell companies, seek to benefit from provisions that the contracting parties to the Energy Protocol did not intend to afford them. The drafters presumably sought to ensure that the treaty's protections reached only the intended beneficiaries: West African companies. At the same time, local subsidiaries of multinationals will also benefit from the treaty's protections unless Article 17 of the Energy Protocol is triggered. Each contracting party undertakes to accord fair and equitable treatment at all times to investments of investors. While there is no universally accepted definition of the exact meaning and/ or scope of treatment that is "fair and equitable," investment treaty tribunals have typically condemned measures that frustrate an investor's legitimate expectations (e.g., decisions taken in violation of guarantees provided to investors in an attempt to induce their investment, such as in the context of privatizations) or measures that are arbitrary, lacking in due process, or taken in bad faith (e.g., prejudicial interference in the activity of an operator on spurious or pretextual grounds). For example, tariff-setting decisions issued by an independent regulator that cannot be traced back to an operator cost analysis or that are issued to implement political directives in violation of the regulator's duty of independence may constitute a breach of the fair and equitable standard. Article 13 of the Energy Protocol prohibits nationalization and expropriation, or measures having equivalent effects, except where they are justified by a purpose that is in the public interest, are not discriminatory, are carried out under due process of law, and are accompanied by the payment of prompt, adequate and effective compensation. A measure of expropriation that does not respect these conditions is considered an "illegal" expropriation in breach of the Energy Protocol. Investors should also note that Article 13's broad wording does not restrict their claims to direct takings of their investment by the state. Rather, Article 13 allows for claims of indirect expropriation (an expropriation that does not affect the legal title of the owner) or creeping expropriation (an expropriation that is achieved through a series of measures). Examples of indirect expropriation include the revocation of a permit resulting in the total loss of value of the investment. A creeping expropriation can occur, for instance, after a series of adverse regulatory decisions lead to the bankruptcy of the regulated operator. For example, a series of decisions to end or reduce subsidies to operators in renewable energies, which amount to a loss of the investments, may constitute a creeping expropriation. Although the Energy Protocol has not yet served as a basis for an international arbitration claim, its contracting parties should be aware of the international obligations they enter into under the Energy Protocol, and of their potential international liability if they violate these obligations. Similarly, energy sector investors should keep this potential avenue for redress in mind when investment planning as well as during the life of their investment. If their investment is adversely impacted by state measures taken in violation of the Energy Protocol, investors may be able to claim damages for any resulting loss. 1 OECD Business and Finance Outlook 2016, Chapter 8: The impact of investment treaties on companies, shareholders and creditors, p. 224 (https://www.oecd.org/daf/inv/investment-policy/BFO-2016-Ch8-Investment-Treaties.pdf). 2 E. Denters, T. Gazzini, "The Role of African Regional Organizations in the Promotion and Protection of Foreign Investment," Journal of World Investment and Trade, 2017, Vol. 18, pp. 449-492, spec. p. 451. 3 ECOWAS is composed of: Benin, Burkina Faso, Cape Verde, Côte d'Ivoire, Gambia, Ghana, Guinea, Guinea-Bissau, Liberia, Mali, Niger, Nigeria, Senegal, Sierra Leone and Togo. 5 South Africa terminated its bilateral investment treaties. Tanzania recently adopted legislation in the natural resources sector that, among other things, prohibits international dispute resolution in relation to the exploitation or extraction of natural resources. 6 "Economic Activity in the Energy Sector" means an economic activity concerning the exploration, extraction, refining, production, storage, land transport, transmission, distribution, trade, marketing or sale of energy materials and products (e.g., nuclear energy, coal, natural gas, petroleum and petroleum products and electrical energy) or concerning the distribution of heat to multiple premises. 7 Article 1(13) of the Energy Protocol. 8 The Energy Protocol would be an additional remedy where there is already an intra-ECOWAS bilateral investment treaty or an alternative multilateral investment treaty. Mining is one of Africa's flagship industries and a growth engine for many of the continent's countries, such as Angola, Côte d'Ivoire, the Democratic Republic of the Congo (DRC), Ghana, Mozambique, Namibia, Nigeria, South Africa, Tanzania and Zambia. The nature of the mining business, which involves significant long-term capital investments, high potential returns and sensitive political issues, makes disputes inevitable. It is worth exploring if and to what extent international arbitration offers a suitable and effective dispute resolution mechanism for typical mining disputes. While each dispute is unique, from a systematic perspective, Figure 1 represents an attempt to classify typical mining disputes. 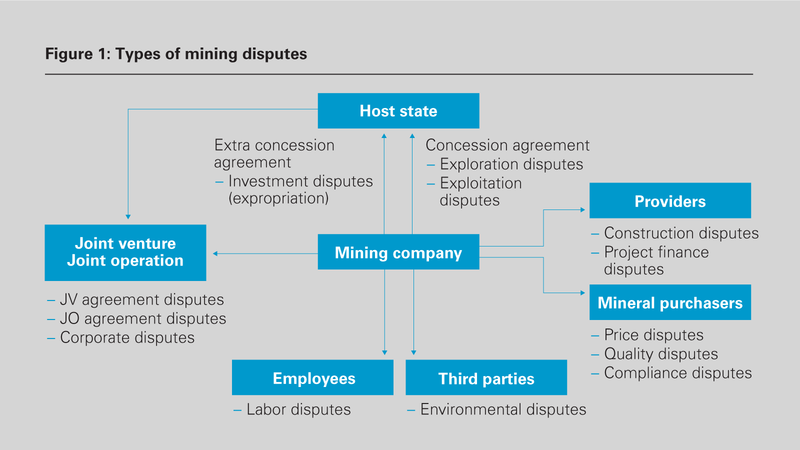 Disputes with the host state: Interaction between the mining company and the host nation (or its state-owned companies) is inherent to the mining business. With few exceptions, the host nation will own the mineral resources. This interaction can generate a variety of disputes that may be suited to international arbitration. These disputes can relate to the mining company's exploration and exploitation rights under a mining concession agreement, mining title, mining right, or mining license conceded by the host nation and regulated under the host nation's mining legislation (together, "concession agreement"). Violations of these rights can include safety issues, such as receiving inadequate protection from the host nation, the outbreak of war and similar force majeure situations preventing performance, as well as incursions on the mines by illegal miners. Disputes may also arise because of adverse measures from the host nation, which may or may not qualify as a breach of the concession agreement. Such adverse measures may include expropriation, discrimination, or unfair treatment by government agencies or national courts, violations of stabilization clauses or withdrawals of tax exemptions. If a dispute arises, the mining company will generally have three ways to resort to international arbitration. First, it may rely on an arbitration clause contained in the concession agreement. Some countries, such as Namibia1 and Tanzania,2 provide for model concession agreements that contain an arbitration clause. Third, depending on the type of governmental measure at issue, the mining company may have access to investment arbitration under an investment protection treaty. Africa accounts for 922 bilateral investment treaties (BITs), most of which refer to investment arbitration in case of dispute, very often under the International Centre for Settlement of Investment Disputes of 1965 rules.4 Having been ratified by 154 member nations (48 in Africa alone),5 the ICSID convention sets forth a self-contained enforcement regime, which requires mandatory recognition and enforcement of a valid award.6 Besides these BITs, there are regional investment agreements like the Investment Agreement for COMESA and the SADC Protocol on Finance and Investment, which also contain provisions for investment arbitration. International arbitration is not only available to mining companies and foreign investors. A host nation may seek recourse against a mining company under either the concession agreement or the applicable law, for example, for failing to perform the exploration or exploitation, not paying the concession fees, taxes and bonuses, or for environmental damages. In such cases, international arbitration is also an option, if the arbitration clause allows the dispute to be decided by an arbitral tribunal. The advantages of international arbitration include a neutral forum, decision-making by experts, a final decision that can be widely enforced and the potential to keep the dispute confidential. Disputes with contractors and service providers: Mining companies collaborate with many contractors and service providers at all stages of project development and operation. This can lead to construction and other commercial disputes, which are generally suitable for international commercial arbitration. Whether such disputes may be submitted to arbitration will ordinarily not depend on the laws of the nation where the project is developed, since contractors and financiers are most often located in third countries. In this respect, international commercial arbitration is traditionally used as a dispute resolution mechanism for construction disputes, since it provides for highly qualified arbitrators, counsel and experts. Disputes within the supply chain: Disputes may also arise with purchasers of minerals (usually commodity traders or processing companies), for example, because of pricing, quality issues or compliance issues (such as conflict minerals, child labor, alleged breaches of anti-bribery or anti-corruption legislation). These disputes can be heard in international commercial arbitration, based either on an arbitration clause in the purchase agreement or a subsequently concluded arbitration agreement. Procurement disputes are another common type of dispute. Mining companies regularly buy bulk industrial materials like heavy fuel oil, gas, tires and sulfur, often on the basis of long-term supply agreements, and arbitration clauses in procurement agreements are common. The advantages of international arbitration include a neutral forum, decision-making by experts, a final decision that can be widely enforced, and the ability to keep the dispute confidential. Disputes within a joint venture or joint operation: Mining operations are often structured as joint ventures or joint operations (sometimes with a state-owned company as mandatory partner). Consequently, disputes may also arise from the joint venture or joint operation agreement or regarding the operation of the joint venture company. Subject to the arbitrability of intra-company disputes, arbitration would seem to be a valid option for resolving these commercial disputes. Therefore, it is common to opt for a third-state substantive law for the joint venture or joint operation agreement and to provide for international commercial arbitration as the exclusive dispute resolution mechanism. In this context, the main advantages of international arbitration are again forum neutrality, a final and enforceable decision, and—last but not least—the ability to keep the dispute confidential. Disputes with employees and third parties: Finally, a mining company, just like any industrial operation, may face issues with its employees. Due to the often- remote location of the assets and the likely interaction with the adjacent areas, a mining company may also encounter disputes with groups such as indigenous populations claiming violations of their traditional, human and environmental rights. These disputes in general may be heard by local courts, and in some cases are mediated with involvement from local and international NGOs. As the mining industry grows in many African countries, so does the potential for disputes. This holds particularly true in times of resource nationalism, when host governments try to act against investors to increase their control of, and the value derived from, developing natural resources located in their territories.19 For many of the potential disputes, international commercial arbitration provides an effective dispute resolution mechanism with features preferable to domestic court proceedings. In some cases with unlawful host nation intervention, investment arbitration will offer the only effective remedy. 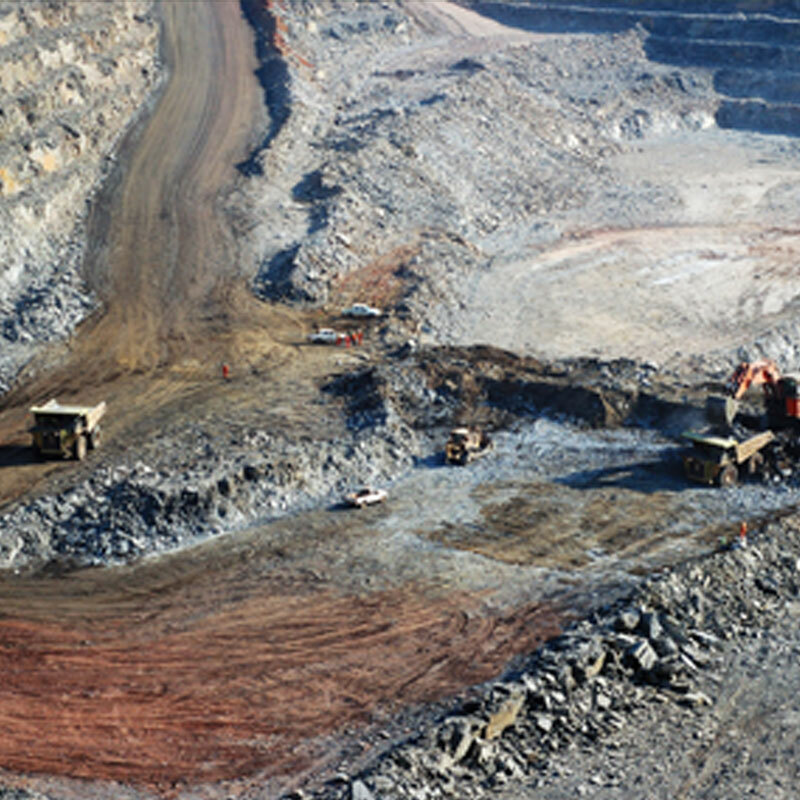 Mining companies are well advised to devise their dispute resolution strategy before disputes arise. The authors would like to thank Ms. Natalia Filandrianou, LL.M., for her valuable research contributions. 1 Article 29 of the 1998 Model Petroleum Agreement (https://www.resourcecontracts.org/contract/ocds-591adf-0557496060/view#/). 2 Clause 28 of the 2013 Model Production Sharing Agreement (https://www.resourcecontracts.org/contract/ocds-591adf-8006566420/view#/). 3 Article 319 of the DRC Mining Code (as amended in 2018); Section 27(3) of the Ghana Minerals and Mining Act 2006. 6 Article 54(1) of the ICSID Convention. 8 International Quantum Resources Limited, Frontier SPRL and Compagnie Minière de Sakania SPRL v. Democratic Republic of the Congo, ICSID Case No. ARB/10/21 cf. https://www.italaw.com/cases/567 https://globalarbitrationreview.com/article/1030879/first-quantum-settles-congo-claims. 10 Miminco LLC v. Democratic Republic of the Congo (Consent Award), ICSID Case No. ARB/03/14, 19 November 2007, Arbitration Intelligence Materials. 11 Miminco LLC v. Democratic Republic of the Congo (Consent Award), ICSID Case No. ARB/03/14, 19 November 2007, Arbitration Intelligence Materials, pp. 4, 6. 12 Miminco LLC v. Democratic Republic of the Congo (Consent Award), ICSID Case No. ARB/03/14, 19 November 2007, Arbitration Intelligence Materials, p. 4. 13 Piero Foresti, Laura de Carli and others v. Republic of South Africa, ICSID Case No. ARB(AF)/07/1, cf. https://www.italaw.com/cases/446; Burnett/Bret, Arbitration of International Mining Disputes, OUP 2017, Appendix 2, p. 307, para. 60. 16 https://www.italaw.com/sites/default/files/case-documents/italaw8035.pdf; see also de Paor, Climate change and arbitration: annex time before there won't be a next time, Journal of International Dispute Settlement, Volume 8, Issue 1, 1 March 2017, pages 179–215. 17 Senegal wins court case against Arcelor Mittal – government: https://www.reuters.com/article/senegal-arcelormittal/senegal-wins-court-case-against-arcelor-mittal-government-idUSL5N0H64EZ20130910. 18 Burnett/Bret, Arbitration of International Mining Disputes, OUP 2017, Appendix 2, p. 307, para. 65. 19 Burnett/Bret, Arbitration of International Mining Disputes, OUP 2017, p. 29, para. 5.01.